The shores of the Caribbean Sea offer beauty in tropical paradise. Year after year, millions of tourists enjoy bathing under its warm sun. Among them, Cartagena de Indias is one of the most popular Caribbean tourist destinations. Located in northern Colombia, Cartagena de Indias is an option for those wishing to relax on the beautiful Caribbean coastline beaches while captivating its audience with its historical charm. Downtown historical tour, places of interest, and tickets to the San Felipe Castle. Tour from 2:00 pm – 6:00 pm. Downtown historical tour, places of interest, and a visit to the modern city. Does not include tickets to museums. In this specialized tour of Cartagena aboard our double decker tourist bus you will have the opportunity to see and hear the story of the most emblematic places of Cartagena. In addition, if you purchase a combo, you can enjoy a lovely day in Isla del Sol. Multilanguage system: English, Spanish, German, French and Italian. 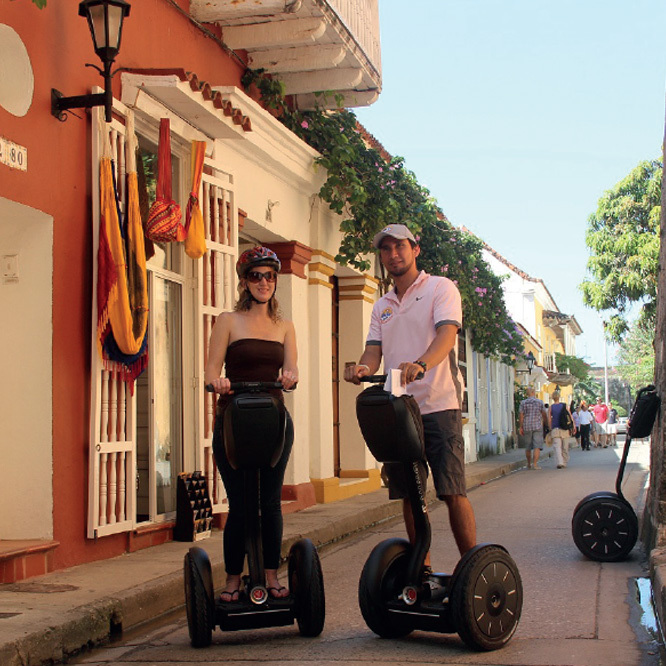 Tours offer our guests the opportunity to step back in colonial times and immerse themselves in the rich history of Cartagena. Several stops along the way bring the colonial city back to life with the help of expert commentary by our guides. Includes: Training, segway, interpreter, and guide. Nothing easier than hopping on a bike to explore the beautiful landscapes offered by our Cartagena de Indias. Rent a bike or two, or however many you might need. Includes: Bicycle and safety equipment. A pleasant meeting point to get together and celebrate after a good round of golf or just the perfect spot to enjoy an unforgettable time with family and friends. This place, equipped with screens to enjoy major sporting events, especially golf, is the ideal place to share a good drink or cocktail such as a Karibana with blue curacao base, vodka and orange juice stage. Includes: Golf cart with GPS and 18-hole round. If you are visiting Colombia, especially Cartagena de Indias, you cannot go without first learning to dance Salsa. At Casa La Cartujita, we offer you the opportunity to learn with your friends or partner, by taking lessons with fun teachers in a unique atmosphere. Don’t worry about needing to go to the dance school. Just give us a date and time and we will schedule it for you. In a particularly beautiful kitchen equipped with the necessary elements to satisfy the most demanding culinary tastes, Casa La Cartujita offers guests personalized cooking classes where you can learn to make the most iconic dishes from our city. Immerse yourself in an intricate jungle of colors, flavors, rhythms, and chaos that will make you feel more alive than ever. Our local guide will take you by hundreds of stands with all types of products to find the most surprising hidden jewels of our Afro-Caribbean and indigenous culture. 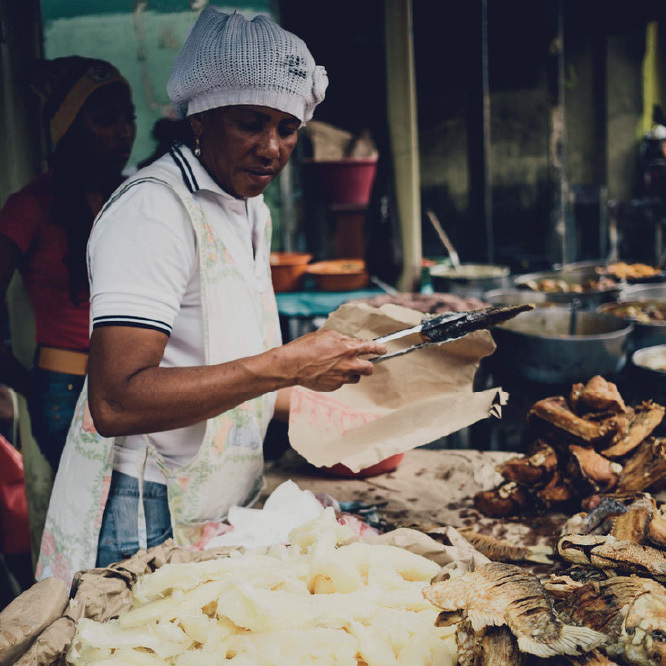 Regular tour includes: Transportation, interviews, photos and autographs with stall owners, English guide, lunch, and samples of typical food from the region. Private tour includes: Private transportation, interviews, photos, autographs with stall owners, and English guide. Tour does not include lunch.